There is a Doctor right in our neighborhood. He lives two blocks from us. We actually used to drive all the way from LaDigue to see him sometimes. He has seen Troy, Noah, Phoebe and Paige so far. Once Troy came to him crippled in pain and the Doctor ordered him to a hospital ... which turned out to be good and important advice. We find him totally entertaining ... And often hard to follow. Troy says he is just like the Doctor on the Simpsons, mainly because he laughs at inappropriate times and makes jokes about dying. He was trained in the States and speaks English with a thick Haitian accent. His "style" is quite Caribbean. When we got there at 2:30 last week he said "Why do you come so late?" We said, "Uh, because we were just finally thinking we should have someone listen to Troy's cough/chest." Then he said "Well I am open until 4, but you should not come this late." Uh. Okay. Noted. He examined Troy, declared it Bronchitis and gave him a shot of some anti-biotic in the rear. 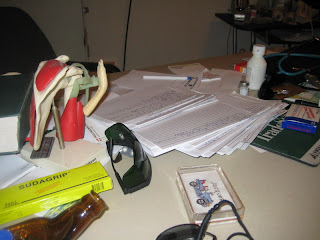 A prescription was written and then discarded since he happened to have the third-world cough medicine in his cabinet. It is called RESPIRA - "The X-TRA power cough formulation". The product literature probably did not originate in English, but assured us that it is for "When Productive Cough is Difficult to Expectorate". He asked if we had gone to get our absentee ballot forms from the Embassy. We said no, we had not but why was he asking? He said, "You need to vote ... For McCain." We went on to question him further and he said that the economy is going to be crud either way ... But he believes it will be less cruddy with McCain. He doesn't trust politicians to run the government from either side, but thinks one side has the money part figured out better than the other. The entire conversation was alternate reality ... and because he has dual citizenship, he was off to the embassy the next morning to cast his vote. 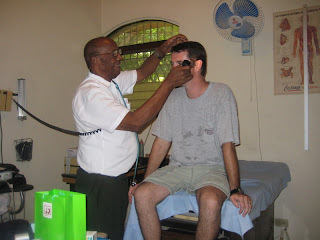 At the end of the appointment we gave him what amounts to about $25 USD. Meanwhile, 30 miles from here Pierre fought a cough and pain and was literally dying without us really knowing he was suffering. We had gotten frustrated at the lack of answers about his LEG and we thought we were dealing only with the leg issue ... and felt that the system was messing with him and giving him the runaround. Once he was dicharged from the little hospital and TB was ruled out he went home. Pierre and his family felt like going to Cange might be the next best idea, but we were uncertain and confused. He needed surgery to remove a growth where his leg had been amputated and we wanted to talk with Healing Hands and a Doctor in town here. We told them we would go talk to the Doctor and try to get the straight medical answer that they had not been given. Then Troy came down with his high fever and we put Pierre on hold. We told his family we would help but that Troy needed to be able to be up and on the move to go do the research. We were shocked and really truly saddened to hear that he died in the night on Friday. We don't even know WHY or HOW ... and the family will never know either. So often the complicated system is what keeps people from getting help. It is no wonder a mother of a sick baby does not always seek help ... if you've been around you know that finding help is no easy thing and getting attention requires both unending patience and much persistence ... and in Pierre's case Troy and I did not even succeed at that. One of the hardest parts is the sincere thanks the family offered when they shared the news of his passing ... they were kind, and gentle, and grateful ... for our NOT solving his problem and our NOT getting him his answers. It is sad and wrong. We want a "do-over" and we wish we could understand why we were so clearly called into that situation but the result was not what we had imagined, prayed or hoped for Pierre.